Clematis Picardy Flower – Alameda Homestead. 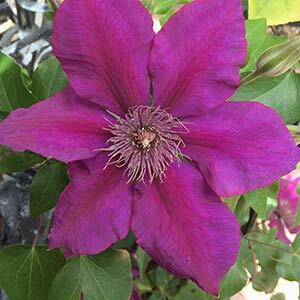 Clematis are a popular climbing plant with wonderful colourful flowers. A number of varieties are available for sale from specialist wholesale clematis nurseries with mostly the new hybrids being popular. Some species are widely sought after and these are available from specialist growers. Position – Full sun with shaded cool root run to light shade. Width – Will spread to .5m, however can be trained to grow along fences to 3 metres. Widely used as a feature climbing plant with large flowers. Also suited to grow as a deciduous or evergreen screening plant depending on variety. Evergreen varieties are the best choice as a climbing wall cover. Many varieties can be allowed to scramble through other plants with no real problems. Clematis are are also suited to growing in conatiners which makes them a good plant for patios, balconies and verandahs.